One of the biggest decisions to be made during the divorce process is what will happen to the family home? This decision is more than just a legal one. It impacts both emotions and finances. Although there are many factors to consider, generally there two options for the home – either one spouse will keep it or it will be sold. Option A. One Spouse keeps the home. How do you decide who keeps the home? Which spouse can afford the mortgage and all expenses associated with the home? How does the non-possessory spouse get paid equity? Regardless of which spouse keeps the family home, generally both spouses are entitled to an equitable distribution of the equity in the home. If both spouses’ names are on the mortgage, the spouse keeping the home will need to refinance the mortgage into his or her individual name, to remove the other spouse from that liability. Make sure the spouse keeping the home meets with a mortgage broker to assess whether he or she will qualify for the refinance. For example, does that spouse have the income to qualify for the refinance on his own? Or, does that spouse have a family member who is willing to co-sign on the mortgage with her? Option B. The parties sell the home. Which realtor will you use? What repairs are needed to list the home for sale? What will be the listing price? What is a fair final acceptance price? If you and your spouse can’t reach an agreement on all of the necessary decisions involved in selling the home, the Court can enter an Order that provides clear instructions for both parties to follow. Once the home is sold, the proceeds can be divided pursuant to an agreement reached between you and your spouse. If you haven’t reached an agreement regarding how to divide the proceeds from the sale of the home, the proceeds can be held in the trust account of either spouse’s attorney for safekeeping until a decision has been made. This ensures the proceeds remain intact pending a final distribution to the parties. The family home is often the most sentimental and financially valuable asset in a divorce. 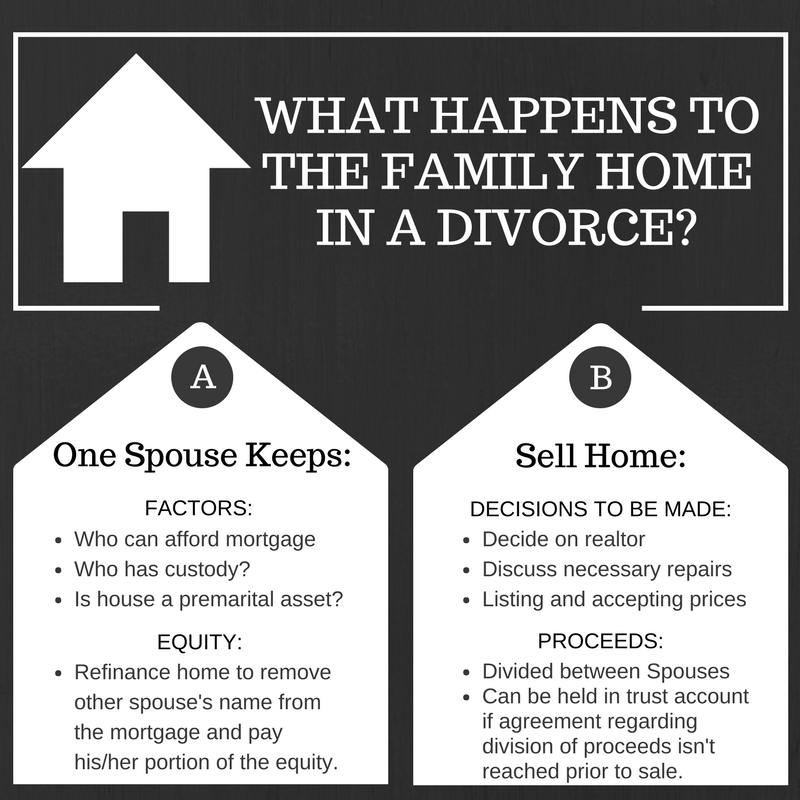 Thus, deciding what happens to the family home in a divorce is a complex legal, emotional, and financial decision. Seek counsel from an experienced family law attorney to assist you in this decision-making process to ensure you fully understand your rights and options regarding the family home.